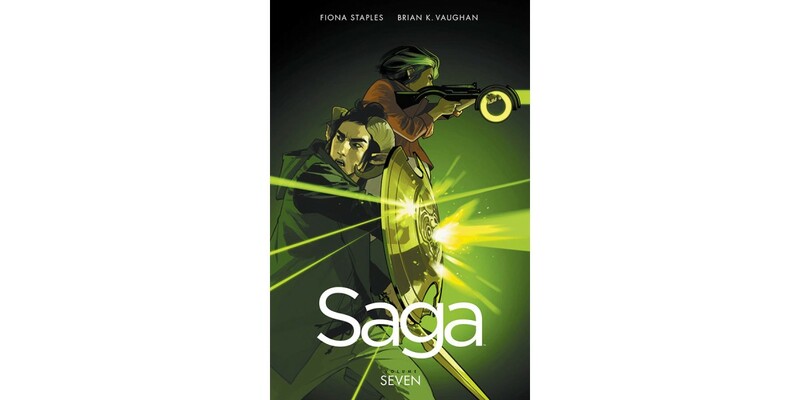 The worldwide bestselling team of Fiona Staples and Brian K. Vaughan will release the seventh trade paperback collection of their ongoing multiple Eisner Award-winning series SAGA this March from Image Comics. The War for Phang is an epic, self-contained SAGA event! Finally reunited with her ever-expanding family, Hazel travels to a war-torn comet that Wreath and Landfall have been battling over for ages. New friendships are forged and others are lost forever in this action-packed volume about families, combat, and the refugee experience. SAGA, VOLUME 7 (Diamond code: JAN170850, ISBN: 978-1-5343-0060-6) arrives in comic book stores on Wednesday, March 29th and bookstores on Tuesday, April 4th. The final order cutoff deadline for retailers is Monday, February 13th. It is available for preorder via Amazon, Barnes & Noble, Indiebound, and Indigo.